Eu me sinto grato e honrado por ter sido selecionado pelo IEEE Board of Directors como candidato à posição de 2019 IEEE Presidente-Eleito, o qual se tornará IEEE Presidente em 2020. Nesse website, eu gostaria de apresentar algumas informações sobre minhas atividades e compartilhar com vocês minha visão sobre possíveis direções para ações futuras do nosso IEEE. Aprecio e valorizo muito seus comentários, questões, Críticas e sugestões. Espero o seu apoio e respeitosamente solicito o seu voto nas eleições do IEEE. Obrigado por visitar meu site. IEEE Society/Council active memberships/services: CIS, ComSoc, CS, CSS, EMBS, IMS, PES, PHOS, RAS, SMCS, SPS, BIOMC, SYSC, WIE. **The opinions expressed on this website are the opinions of the author and not necessarily the opinions of IEEE. O IEEE posiciona-se como líder mundial em ciência, tecnologia e inovação. Devemos continuar a ser a principal referência em nosso campo e continuar a crescer como motor de inovação, identificando as necessidades e oportunidades emergentes. Continuando a ser a fonte confiável de conhecimento de alta qualidade, facilitando o acesso à informação com sistemas de recomendação, fornecendo conhecimentos práticos para profissionais, oferecendo dados e repositórios de experimentos para pesquisa e inovação industrial, e criando serviços e métodos de entrega inovadores para os profissionais do futuro. Estou plenamente empenhado em servir à nossa comunidade, com visão estratégica e orientação, incentivando a participação, galvanizando o entusiasmo e catalisando as competências e aspirações ricas e diversas de membros e voluntários. Eu imagino uma visão holística para Um IEEE, ao mesmo tempo que nutre as comunidades locais. Um IEEE no qual todo mundo encontra valor e se sente orgulhoso de ser. Um IEEE por pessoas, para pessoas. In this video, I briefly introduce my vision for strategic actions to nurture our IEEE and the entire scientific, technical, and professional community in our field, both worldwide and locally. Vincenzo Piuri is Full Professor at the University of Milan, Italy (since 2000), where he was also Department Chair (2007-2012). He was Associate Professor at Politecnico di Milano, Italy (1992-2000), visiting professor at the University of Texas at Austin, USA (summers 1996-1999), and visiting researcher at George Mason University, USA (summers 2012-2016). He founded a start-up company, Sensure srl, in the area of intelligent systems for industrial applications (leading it from 2007 until 2010) and was active in industrial research projects with several companies. He received his M.S. and Ph.D. in Computer Engineering from Politecnico di Milano, Italy. His main research and industrial application interests are: intelligent systems, computational intelligence, pattern analysis and recognition, machine learning, signal and image processing, biometrics, intelligent measurement systems, industrial applications, distributed processing systems, internet-of-things, cloud computing, fault tolerance, application-specific digital processing architectures, and arithmetic architectures. 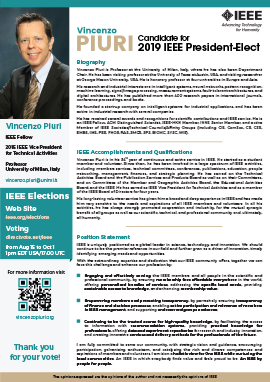 Vincenzo Piuri is in his 33rd year of continuous and active service in IEEE, first as a student member and volunteer, and more recently as member of the IEEE Board of Directors for 4 years and IEEE Vice President for Technical Activities. He has been actively involved in many aspects and at many levels within IEEE activities and operations, including members services, technical committees, people networking, conferences, publications, education, finances, and management. In all these activities, he always had a comprehensive vision for IEEE as a single holistic entity as One IEEE, strongly promoting cooperation and inclusivity, for the mutual synergic benefit of all groups as well as our scientific, technical, and professional community and, ultimately, the entire society.